The Minnesota Wild look to build upon the success of last season. The path towards accomplishing this goal was mapped with the release of the 2013-2014 regular season schedule. The Wild’s regular season will span 192 days beginning on October 3rd at home against Los Angeles and concluding on April 13th at home against the Nashville Predators. The club will establish some new rivalries this season in the newly named Central Division. They will play at least one home and one away game against all other teams in the Atlantic, Metropolitan and Pacific Divisions. The NHL schedule has been revamped because of realignment. The new format will see the Wild play a total of twenty-nine regular season games against the Central Division this season. The number of home and away games played against each team in the division will vary each year. Under the new format, the Wild will play almost all of the teams in the Central Division five times each. There is one exception to this formula. The Wild will play one team in the division only four times in a season and this team will rotate each year. The Wild will play three home and two away games against the Chicago Blackhawks, Nashville Predators and St. Louis Blues this year in the regular season. The Colorado Avalanche and Winnipeg Jets will only visit St. Paul two times each while the Wild will travel to play three games in each of these cities. Dallas is the exception to the rule this year. The Wild will only play two home and two away games against the Stars. Of the Wild’s regular season games, 35% will be played against Central Division rivals. This will pave the way for some very interesting divisional hockey. The Wild will play an additional twenty-one games against Pacific Division teams this year. However, the number of home and away games played against teams in the Pacific Division will vary from season to season. This year the Calgary Flames, Edmonton Oilers and Vancouver Canucks will play at the Xcel Energy Center twice while the Wild will only travel once to these cities. Meanwhile, the Wild will play one home game and two away games against the Anaheim Ducks, Los Angeles Kings, Phoenix Coyotes, and San Jose Sharks. A new feature of the schedule is that each Western Conference team will have two matchups against teams in the Atlantic and Metropolitan Divisions of the Eastern Conference. This totals thirty-two games each season. The Wild will play one home and one away game against each team in the East. To further evaluate the regular season schedule let’s divide it into three parts to take a closer look at some of the key matchups. For purposes of this breakdown, the beginning piece will span from opening night against the Los Angeles Kings on October 3rd through November 30th’s game against the Colorado Avalanche. The middle portion will start on December 2nd against the Philadelphia Flyers through the last game before the Olympic break on February 6th against the Nashville Predators. The final group is made up of the games after the Olympics beginning with February 27th‘s game against the Edmonton Oilers and ending with the last game of the regular season against the Nashville Predators on April 13th. 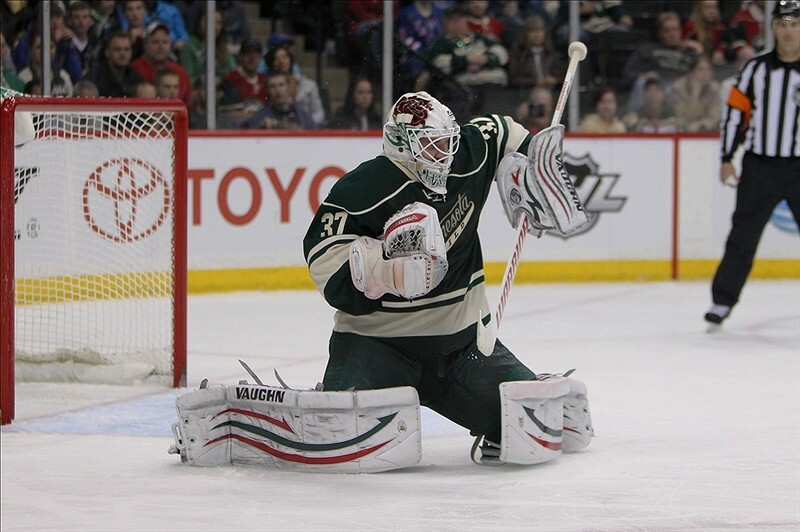 The Wild will play twenty-eight games in the first two months of the 2013-2014 regular season. 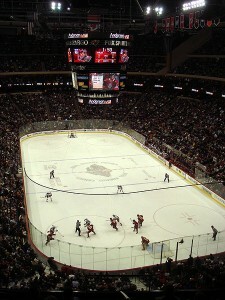 During this span, the club will host fifteen games at the Xcel Energy Center while playing thirteen road games. Wild fans will get to see a ton of Western Conference action in the early stages with ten of the Wild’s first fifteen home games against Western Conference teams. In the first thirteen games against Eastern Conference opponents, nine games are against Atlantic Division teams and four games are against Metropolitan Division teams. Perhaps the most interesting game in this early stage of the season is November 3rd when the New Jersey Devils come to town for the first time since Zach Parise joined the Wild. Minnesota will play its division rivals in the Central Division eleven times in the beginning of the season. The club will face the Winnipeg Jets three times, the Chicago Blackhawks, Nashville Predators and Colorado Avalanche twice and the St. Louis Blues and Dallas Stars one time each during this stretch. The Wild did not play the Winnipeg Jets last season who were members of the Eastern Conference. Minnesota posted a combined record of 9-6-2 against Chicago, Nashville, Colorado, St. Louis and Dallas last season. This record is skewed by the Wild’s 4-0-1 record against the Avalanche. To keep pace with the top teams in the Central Division, the Wild will need to move fast out of the gate during this stage of the season. Head Coach Mike Yeo will need to do his best to find the right line combinations between his youth and veterans. Finding good chemistry early is much easier said than done. However, the Central Division is guaranteed to be a grueling battle all season long. The Wild can get on the right track to make the playoffs by getting off to a fast start. Under realignment, only the top three teams in each division are guaranteed a playoff berth. If the Wild can come out of the gate strong playing consistent hockey, the squad can set the pace for the top teams in the Central Division. The Wild will play thirty-one games from the beginning of December through the club’s last game before the Olympic break on February 6th. Minnesota will again play eleven games against division rivals during this stretch. The club will also battle the Pacific Division ten times. The Wild will play seven of these ten games against the Pacific Division on the road. Several notable Eastern Conference teams will travel to St. Paul during this stretch. Pierre-Marc Bouchard will return with his new club, the New York Islanders, on December 29th. Wild fans will get their first look at three of the NHL’s premier forwards when Steven Stamkos, Martin St. Louis, and Jonathan Drouin of the Tampa Bay Lightning visit on February 4th, 2014. Other notable matchups include the Pittsburgh Penguins, Philadelphia Flyers and Ottawa Senators. December through the Olympic break will prove to be a crucial stretch for the Wild. Under the new alignment rules, there will be two wild card playoff qualifiers in each conference. These spots are not specific to any division. The teams who qualify for the wild card spots will do so by having the best regular season point total just behind the top three teams in each division. 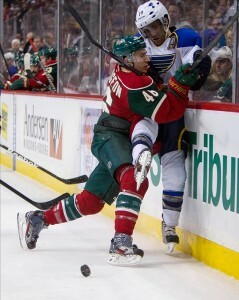 In playing Western Conference opponents twenty-one times during this stretch it is vital that the Wild perform well. They will be facing off against some old Northwestern division rivals in the Vancouver Canucks, Edmonton Oilers, and the Calgary Flames. The Wild went 12-5-1 in their division last season. A similar run during this stretch will increase the Wild’s odds of qualifying for the playoffs for a second consecutive season. After twenty days off for the Olympics, the Wild will only have twenty-three games remaining on their schedule. Fourteen of these remaining games are against Western Conference opponents. For this reason, it is crucial that the Wild establish a winning record early on in the season. If the Wild fall behind in the playoff race before the break, they may find it difficult in this stage of the season to regain ground in the standings. The Wild will also have to deal with some difficult matchups against the East in the home stretch. The defending Eastern Conference Champions, the Boston Bruins, will play the Wild two times. The Wild will also square off twice against the Detroit Red Wings who are now in the East. The Pittsburgh Penguins, New York Islanders, New Jersey Devils, New York Rangers and Columbus Blue Jackets round out the rest of the Wild’s games against the East. In the last ten games of the 2012-2013 season the Wild had a losing record going 4-5-1. The importance of a fast start is highlighted by the difficult schedule the Wild face at the end of the season. Early success can take some of the pressure off of the Wild in March and early April. If the Wild can keep pace with the top teams, this challenging schedule can be seen as an opportunity for the squad to fine tune their game for the post-season. If they fall behind in the playoff race, it will be difficult for the Wild to make headway during the home stretch. With a young squad and a solid veteran core, there is a lot of Wild fans to be excited about this season. The squad is poised to build upon the success of last year. For the first time, the schedule will bring every team in the NHL to St. Paul this year. By season’s end, the Wild will have travelled 44,443 miles across North America to play in every NHL city. The 2013-2014 season will come to an end on April 13th with the playoffs scheduled to begin on April 16th. The Wild hope to make a deeper playoff run this season. This goal will hinge on the team’s ability to establish team chemistry early and play as consistent as possible to remain in the playoff race.